The last "key approval" for the section of TransCanada's Keystone XL pipeline was received last week. 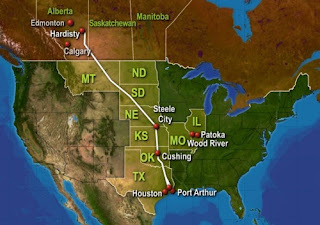 The section runs from the oil hub at Cushing, Oklahoma to Nederland, Texas on the gulf coast. This 400 mile part of the pipeline is apparently now called "the Gulf Coast Project". It's projected to cost $2.3 billion and create 4,000 jobs, it's not clear how many of those would be permanent. This press release has a breakdown of jobs expected to be created. Approval for the other 1,300 miles of the pipeline is not expected any time soon. I doubt there'll be much movement until after the presidential election in November. If Romney wins, approval will likely materialise shortly after. If Obama is re-elected I think it would take a while but ultimately he'll push it through too. Keystone would of course be a big deal for the oil sands industry. It would increase pipeline capacity to the US by about 830,000 barrels a day. It would be an especially big deal for TransCanada, who would start better challenging Enbridge for exports to the states.